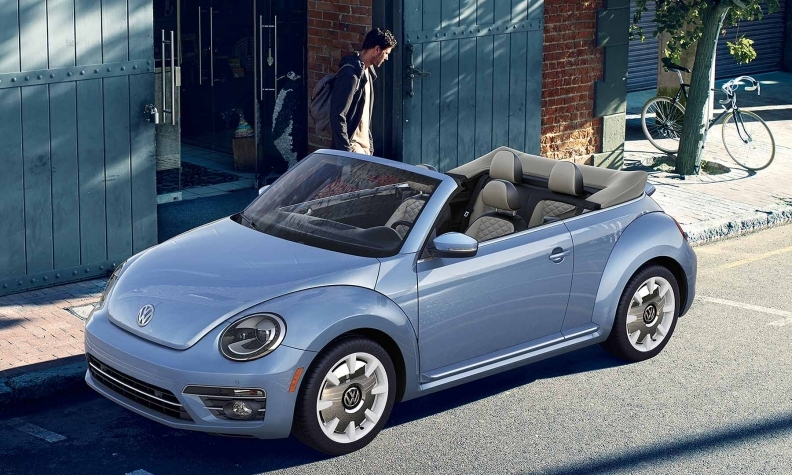 VW's 2019 Beetle Convertible Final Edition. The venerable Volkswagen Beetle has become the latest casualty in America's newfound love affair with crossovers and other light trucks. Volkswagen of America said Thursday it is ending output of the iconic Beetle in 2019, closing another chapter for one of the auto industry's most storied nameplates. The company said production of the modern, third-generation Beetle will end at a plant in Puebla, Mexico, in July 2019. Volkswagen Group of America CEO Hinrich Woebcken, in a statement, said there are no plans to replace the Beetle as the company focuses on becoming "a full-line, family-focused automaker in the U.S." and ramps up electrification efforts. U.S. sales of the Beetle have dropped 2.2 percent this year in a market that is increasingly shifting from cars to light trucks. In Canada, sales are down 34 per cent to 1,564 units through August. Volkswagen CEO Herbert Diess has been a driving force behind the slimmed down product portfolio since he took over the main VW car brand in 2015. Demand for the Beetle and other VW hatchbacks such as the Golf also has come under pressure as customer appetite has shifted toward crossovers and SUVs worldwide. Diess has pondered reviving the Beetle as a fully electric car to tap the model’s cachet in popular culture. The company has touted the upcoming I.D. Neo hatchback to be rolled out in 2020 as the new Beetle for the electric vehicle age. U.S. sales of the Beetle slumped to just 15,166 in 2017, less than one-seventh the sales of the Jetta sedan. In Canada, VW sold 2,849 Beetles in 2017. The automaker sold six times the number of Jettas in Canada. The Beetle, with roots dating back to 1938 in Germany, was revived and updated in 1998 with U.S. sales of the modern Beetle peaking at 83,434 in 1999. The car was created by Ferdinand Porsche and sparked a raft of imitators over time. Volkswagen said two special Beetle models will be offered during the last model year -- Final Edition SE and Final Edition SEL. “The loss of the Beetle after three generations, over nearly seven decades, will evoke a host of emotions from the Beetle’s many devoted fans,” said Woebcken.